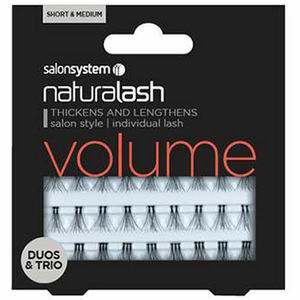 Add volume to your clients' lashes. Salon System's Naturalash Volume Duos and Trios appear in a mixed pack of short and medium length lashes. The individual synthetic lashes are presented in sections of two or three clusters making for speedy applications. 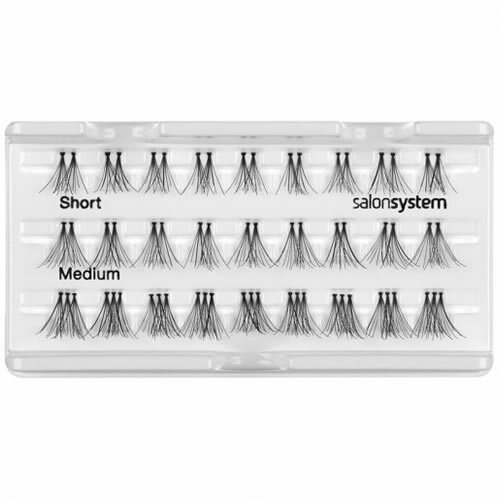 They will thicken, lengthen and add volume to your clients' lashes. They will last for approximately 7 - 10 days. Available in 28 different styles (28 black, 1 blue/black): 020, 040 (Underlash), 070, 100, 101, 102, 106, 107, 108, 109, 116, 117, 118, 119, 120, 121, 122, 123, 134, 135, 140, 143, 145, 146, 149, 155, 201 and 207. Long-lasting and quick-drying strip lash adhesive with applicator for ease of use. Available in Clear or Black. 6-ml bottle.